ionDESK is a trading workspace, far more than just a trading platform! ionDESK is truly the first of its kind to grant traders and investors a place to work and not just trade. We've taken special care to combine ease-of-use with powerful features. 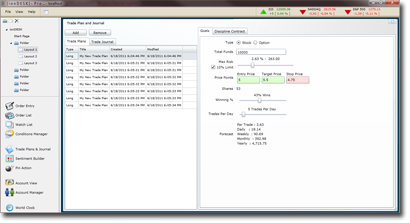 Our trading workspace may be used stand-alone or in a multi-screen scenario with another trading platform. The sections below highlight just a few features that can make a difference in the way you approach the market. 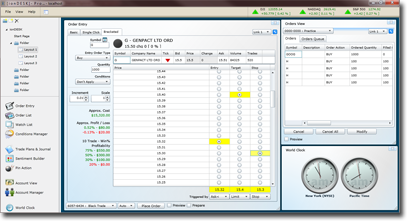 You've heard and read about trade plans, but have you ever used software to build one. Use ionDESK to create a comprehensive trade plan including goal, risk, and real-time probability and profitability calculations. Sentiment Builder allows you to layout, in a timeline fashion, catalyst that may potentially affect your trade. Place market moving events and study the impact of those items in conjunction with other events. Now that you have a clearer vision of possible market moves consolidated in front of you, your trades will become more disciplined. Watch the market the way the pros do. 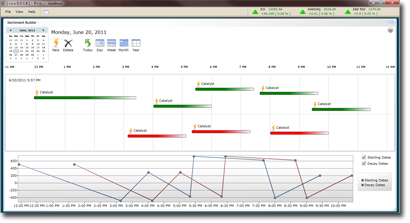 Enter your market focus and then add related items. Enter ticker symbols then sit back and watch the magic. You are able to study the market focus with its related items. 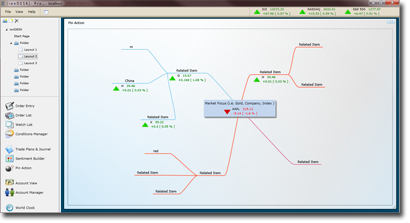 Armed with the knowledge of interrelated stocks, you can visualize and take action on the market the way the pros do.